blog.HalloweenAdventure.com | Latest News from the Costumes Trend FrontLines! : Shrek It Out! Everyone loves Shrek, the big friendly ogre who doesn’t act like a mean ogre at all! Deep down, as Shrek loves to tell everyone, ogres are nice creatures! Like onions, they have layers, so they’re only big bad and mean when they’re defending the ones they love. This Halloween, deck the kids out with Shrek costumes. We have everything from Princess Fiona to Shrek himself! 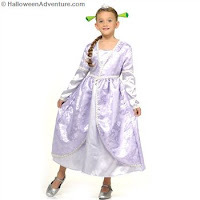 Little ladies will adore our Princess Fiona Deluxe Children’s Costume. This adorable costume includes long green dress with gold accents, belt and headpiece with crown* and ogre ears. It’s meant for ladies with big hearts, who know that it’s personality, not looks, that matter the most. We also have a Princess Fiona Shrek the 3rd Movie Costumethat’ll make your girl look like she just stepped off of a Hollywood sound stage. Costume includes delicate lilac princess dress and ogre headpiece. Infants can join the fun in our Princess Fiona Romper Infant Costume. 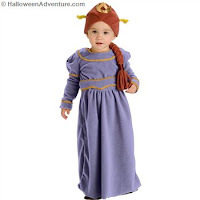 This adorable getup features a purple one piece dress with gold detailing, as well as a headpiece meant to mimic a full head of hair with a long braid and tiny little ogre ears. Male toddlers can get in on the game with our Shrek Toddler Costume. Costume includes a one-piece jumpsuit with brown and green checkered pants and a tan peasant shirt as well as a perfectly Shrek-a-licious headpiece. Older boys will love our Shrek Deluxe Costume with Mask.Costume includes a character mask that transforms you into an ogre, a deluxe jumpsuit with attached tunic and vest, belt and hand covers. 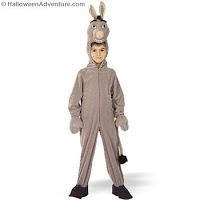 We even have a Shrek Donkey Costume! Shrek’s lovable sidekick comes to life with our gray fleece jumpsuit with front zipper, attached hands and foot covers, and donkey character headpiece. 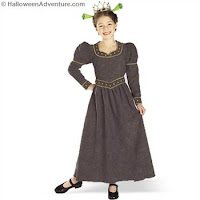 For more Shrek costumes, check out Halloween Adventures online store.